Terrible, miserable, horrendous. Surprisingly, these are words I’m happy to hear. 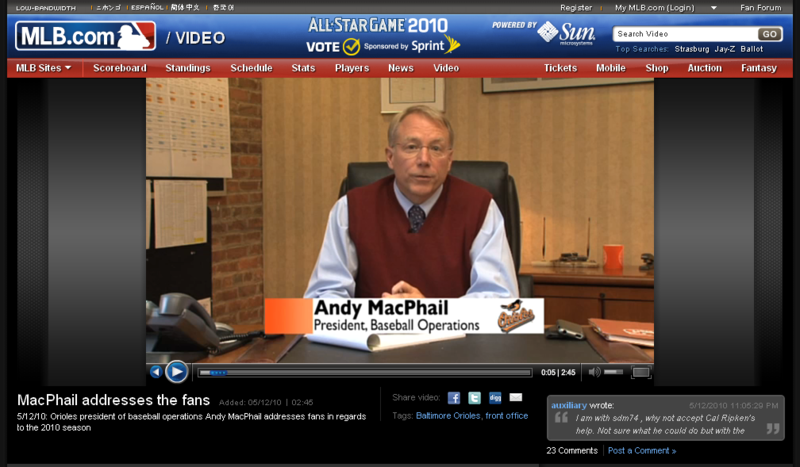 I appreciated Andy MacPhail’s video address to the fans on Wednesday afternoon. Make no mistake about it, this is not something a respected baseball executive, the GM of two World Series champions, has to do. It’s an unprecedented move. Sure, it’s a controlled forum. A press conference with follow-up questions from reporters would be ideal, I suppose, for an angry fan base. But that elevates baseball to a whole new level of import. The president of the United States, who is supposed to answer to the people who elected him, rarely holds press conferences these days, and he makes decisions far more important than which free-agent closer to sign. Andy MacPhail doesn’t owe us any answers. And for that matter, he didn’t provide many on Wednesday. What he did provide was an acknowledgment of how bad things have been so far this season. Phrases like “terribly horrendous start,” “terribly problematic,” and “miserable way to start the season” are not spin. Rather, they represent a baseball executive putting himself on the level of a fan for a moment and saying, “This stinks.” For me, that means something. Too often in the past decade Orioles fans seem to have been an afterthought. The Warehouse has been viewed – sometimes fairly – as aloof and out of touch with local fans. So yes, it does matter that the president of baseball operations put himself on the level of a fan, even if it was just for two minutes and 45 seconds. Stating the obvious? Perhaps. But sometimes even that’s harder than it seems. It’s been nearly 10 years since Syd Thrift spoke about a non-existent player on a radio show rather than admit he’d never heard of the guy. Which do you prefer? Besides, much of sports talk involves stating the obvious. There’s something therapeutic in knowing that others share your pain, even on trivial matters like baseball. Andy MacPhail shares our pain and believes he still holds the remedy. Here’s hoping he does. The post-1997 Orioles franchise has been a disgrace, especially considering Baltimore’s rich baseball history. The 2000s were the worst decade, by win percentage, in team history, worse even than 1954 to 1959 after the St. Louis Browns – “First in booze, first in shoes, and last in the American League”- relocated to Baltimore. The organization has gone from king to jester. If you grew up on Orioles baseball, that hurts. For better or worse, though, fans like me who are desperately hanging on to our affection for this team have to view things in a relative sense. It’s been a tremendous fall from grace, but this franchise isn’t going to become the 1970 Baltimore Orioles overnight. After a slow, sustained fall, it’s a slow, sustained climb back to respectability. Andy MacPhail is currently leading that climb, and it’s a monumental task (literally – we should build a monument to the guy if he turns the Orioles into a winner). He came to Baltimore – only three years ago, mind you – and laid out a vision with an accelerated deadline. A year before that deadline he’s watched a worst-case scenario unfold before his eyes for more than a month. The season that was supposed to whet the fans’ baseball appetite, an appetizer prior to 2011’s main course, has instead given us all food poisoning. If ever there were a time to duck and hide, this would be it. Instead, Andy MacPhail sat before a camera and directed attention toward his team’s struggles. He’s accepted that, for better or worse, he is the public face of a huge rebuilding effort. And that’s no small thing.